This is the second issue of the new Generation Zero series from Valiant Comics. If you are unfamiliar with Generation Zero, they are a group of Psiot kids who escaped from their evil government handlers and now travel around saving people who have no other choice and are desperate enough. Think of it as a short of Harbinger A-Team (sadly lacking of Mr. T though). Last issue we were introduced to Keisha Thomas, a high school student who's boyfriend was murdered because he discovered the truth about what is going on in their town. At the end of last issue Gen Zero had just found Keisha, rescued her from the strange creatures that her brother refers to as the Cornermen, and now we pick up the story with Keisha's father, who is the sheriff of Rook. The Sheriff has the typical reaction to rebellious good looking teens that any sheriff/father would have, telling his daughter to get in the car as they leave the party. Keisha is at school the next day and is called into the principals office, this is where we meet two other members of Generation Zero, the Zycos twins who will be investigating the murder at the school, and also the bizarre member of Gen Zero, a umm physic fetus???? named Gamete???????? that is weird. So we follow the investigation threw this issue. I enjoyed the book, its well written and I'm pretty jazzed by concept itself. The heroes travelling around saving people is a good idea. I hope that the series doesn't end up staying in the town of Rook permanently. It would be a waste I feel. I'm very happy that Fred Van Lente has returned to Valiant's monthly schedule, as he hasn't done so since the end of Ivar, Time Walker. This book is a change of pace from the other books he has done for the company so far, but it's a good change. Once again Frances Portella's art is really good. I love a clean clear art style, so this is right up my alley. A lot of good characters to play with in this one and Portella draws each of them in a way that makes them instantly identifiable, which sometimes is challenging depending on who's drawing. Not a problem here, and it makes the issue that more enjoyable. It was a good issue and I like the direction of the book so far. 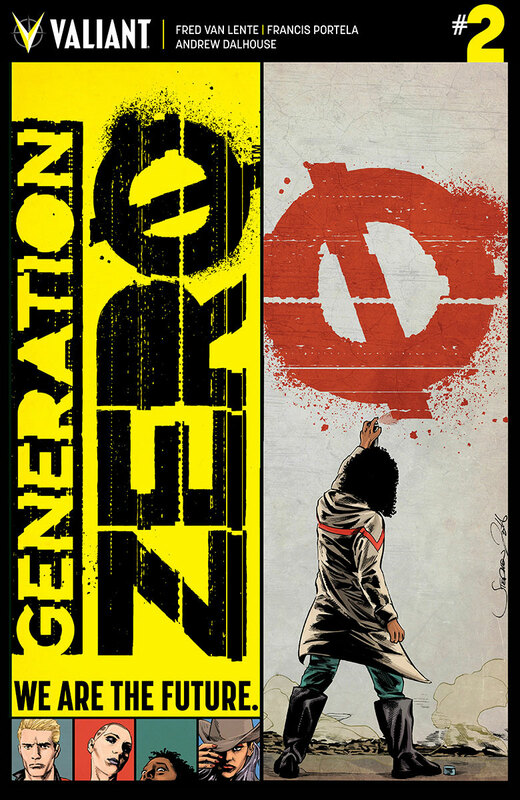 I know some people in the Valiant fan community weren't happy with the first issue of Generation Zero, but I have to respectfully disagree with them. I like the way the characters are being portrayed here, I like the way they are being shown as rebellious youth and I think I will continue to enjoy this comic series. I recommend buying it yourself and making up your mind yourself.